So yes, I now have to beg my wife to do kid dropoff tomorrow, so I can position myself to get great shots of the Space Shuttle! 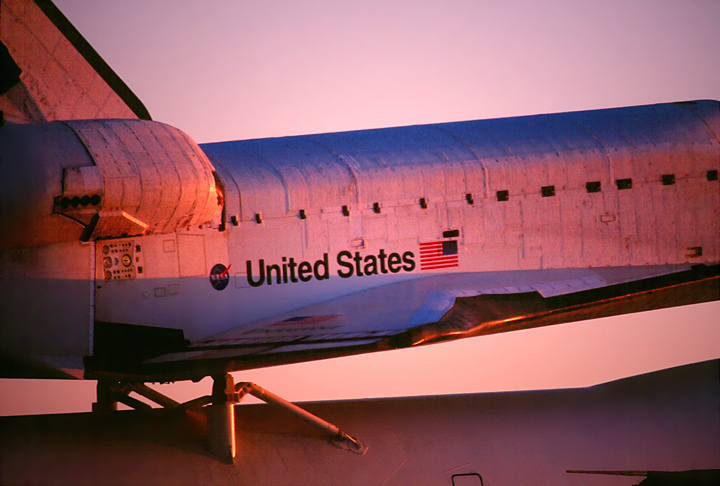 The very first time a shuttle came to Cape Canaveral, NASA did the same thing. They flew the jumbo piggyback all around the area. We stood on the beach there, and watched these two giants float by at low altitude. It was so beautiful. Tens of thousands of NASA employees, along with their families, got to see an Orbiter for the first time, that morning. 30-some years later, am glad I’ll get to see that view one more time. A nice book-end to the entire program. A photo friend alerted me to Shuttle Endeavor’s last scheduled flight. They will fly her over Sacramento, the Bay Area & finally LA, starting early tomorrow morning. Here’s the best post I’ve found so far, regarding viewing spots around here. If you are in Sacramento, or really anywhere along 101, all the way down to LA, you will probably get a great look at Endeavor’s last flight. Notably, Mark Kelly commanded Endeavor’s last flight in space. He’s married to Congresswoman Gabby Giffords, who is recovering from her terrible wounds. Endeavor is making a special flight over Tucson, where they live, to honor their service. These two amazing shots by Deg.IO. Check out David’s site: www.deg.io. Lots of great shots! Worth the e-trip.